Just your average mom stuff – that’s what Simon Jablon had assumed was in the London warehouse that his mother had been filling for years. It wasn’t until 2003, when he received a call to clear the space, did he realize the magnitude of worth being stored within those walls. With the help of his then girlfriend, Tracy Sedino, they discovered pure gold behind the door of that storage unit: three decades of pristine Linda Farrow sunglasses. Linda Farrow’s name became synonymous with style in the 70s. Her line of luxurious sunglasses paved the way for eyewear as a fashion accessory, not just a utility piece for bright beach days. Her innovations molded the iconic shapes, styles and materials that still fuel the fashion industry today and were graced with the talents of legends like Balenciaga, Yves Saint Laurent and Christian Dior. When Simon and Tracy entered that storage space, they opened up a time capsule and immediately knew they had to revive the legacy his mother buried away decades ago. Ten years later, the two are happily married and making Linda Farrow a modern marvel radiating with timeless beauty. 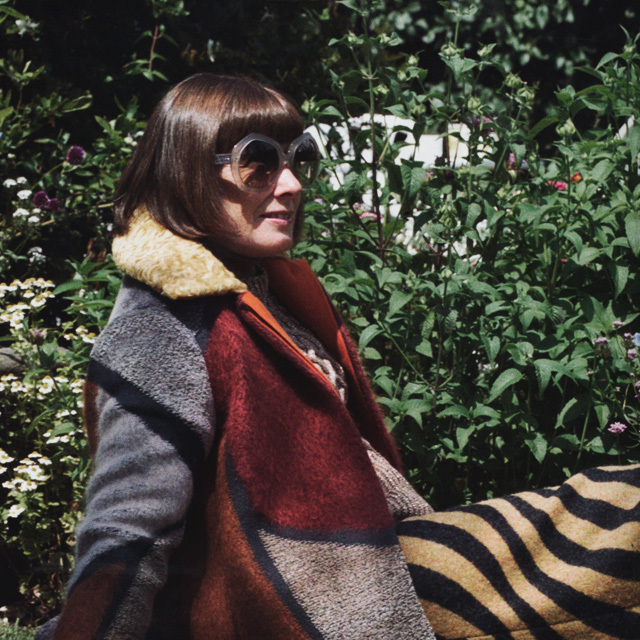 Tracy Sedino is the fiery force to breathe life back into the Linda Farrow name. Alongside her husband’s business savvy, she brings a new creative spirit to the vintage brand, with a personality as bold as her signature red lips and as warm and welcoming as her British accent. A decade ago, at the young age of 22, she would have never guessed that she’d be heralding the new era of the Farrow heritage but she couldn’t be more excited to carry on the innovative elevation of eyewear that Linda started years ago. Her thorough approach makes collaborating for capsule collections an immersive and personal experience for both her and the designers. Working with major labels such as The Row, Alexander Wang, Oscar de la Renta and many more, she aligns with them at the beginning of each season to bring their mood boards to life with the most luxe materials possible. Gold-plated titanium, precious metals, exotic animal skins, and high-fashion designs with a vintage twist keep Linda Farrow a coveted and bestselling line, even after all these years. From screaming in the elevator with sheer excitement after closing their first Harvey Nichols’ deal to having everyone squealing with laughter on the set of our shoot, Tracy Sedino’s passionate personality can reinvigorate any room–especially a room filled with long forgotten sunglasses. This spirit is what brought back to life three decades of hidden treasures. It’s what keeps the classics living throughout the modern times. And it’s what keeps Linda Farrow’s legacy of innovative style thriving after all these decades. P7: Looking back, who was Tracy Sedino before Linda farrow? what was your childhood like? TS: I was actually quite a quiet and timid person, nothing like I am now – I think I grew as a person whilst my journey at Linda Farrow. P7: Did you have any idea of what you'd like to do, when growing up? TS: As a child I always wanted to be in fashion or be a dancer. From a young age I studied contemporary dance but as I grew older my passion was to be a designer. After school I went on to study fashion design and Technology at London College of fashion. P7: Chapter two in your life, is when your career just exploded. What has been your personal growth during the journey with Linda Farrow? TS: Both Simon and I started Linda Farrow, it’s our baby – neither of us had experience and went in niave but with a mission and dream, together we learnt so much to build the business you see Linda Farrow today. P7: Has working in fashion made you change your look on life? TS: Absolutely, it isn’t a glamourous as people think but as its my passion I absolutely love what I do. P7: What have you learned during the decade with Linda farrow? TS: I couldn’t possibly list everything but one thing I did learn was if you work hard and have a dream and are persistent enough your dreams can come true. P7: What is it about your brand that attracts people? TS: I think we have created a lifestyle – I believe Simon and I created a brand not just an eyewear company. We have worked hard on positioning Linda Farrow as a luxury fashion accessory rather than an eyewear brand through marketing, pr and good distribution. P7: Why are accessories so important to fashion? TS: Accessories complete a look it is also a way of defining your personal style. P7: You're always traveling. You must be a genius at packing. Please share your secret? TS: Actually Im terrible, I always pack way too much – after 10 years you’d think I was a genius. P7: What can we expect from Linda Farrow in the future? TS: We now have 3 stores and that is what we are working on now to create Linda Farrow shop experiences internationally in key cities.